How apt, Amy, they are little jewels ... now why didn't I think of that !! Mine have hardly had any low temperatures this year, only a couple of light frosts, so don't give up hope on yours yet! Hi Jane, The Irises are lovely. I especially love the first one....Once again, I need to think more about a plant I haven't paid much attention to! What a beautiful Spot of color to see as you go up and down the stairs. Tbh, I only realised how glorious they are a couple of years ago, and I had managed to ignore them totally for years, as I thought they would just be lost in the garden ... never thought of putting them in pots to admire them! How prescient of you. I hope I can remember to steal this idea when the time is right. 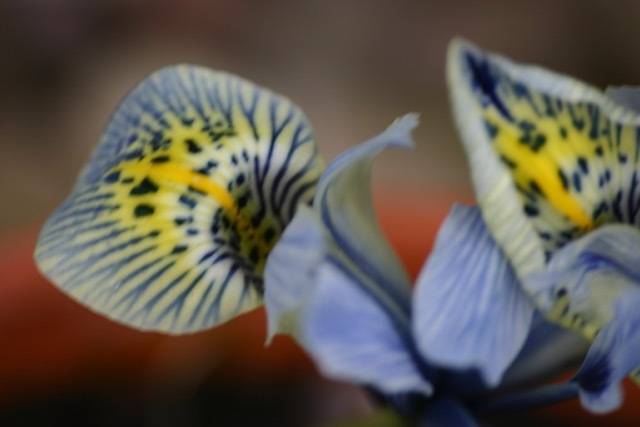 Dear Jane, I absolutely adore iris reticulata and think it is one of the most beautiful of all bulbs that flowers in the winter time. You certainly have chosen some particular beautiful varieties. My favorite is 'Katherine Hodgekins', but I like the other two also very much. 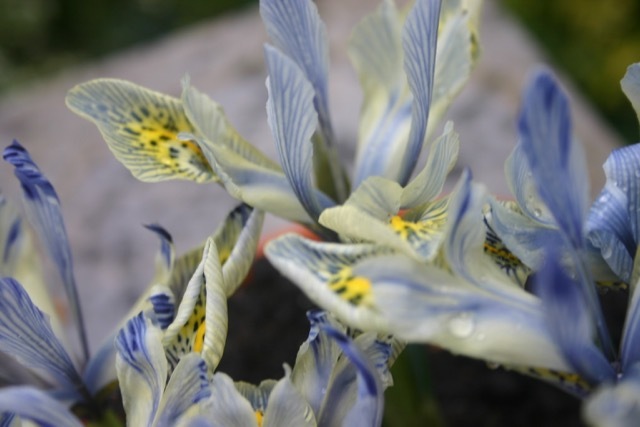 I have to find out if iris reticulata would also grow in Southern California. I doubt so, since I never see the bulbs offered at the local nurseries. At least I can enjoy yours! Thanks for sharing! Hi Christina, sometimes we have to enjoy plants vicariously through other people, which is another reason why blogs are so useful and enjoyable. There are lots of things that I can't grow here but can enjoy via you or others ! Interesting janet - do they naturalise quite quickly and spread ? I love the idea of a drift of blue. Sounds like heaven ! These are gorgeous no matter how you present them. I have never thought about growing these little beauties in pots. That might just be the best way to enjoy them, up close and personal. I will be interested to see how you get on Lisa. I feel that they 'get lost' in the garden as they are so small. I often put the pots on a table so that they are nearer to the eye, and easier to enjoy. 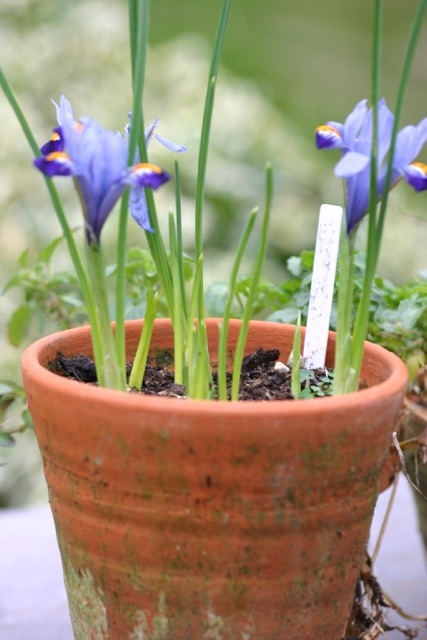 I've just - about an hour ago - planted out some irises that I bought growing in pots to add to those already in the garden. We already had quite a few Katharine and a patch of George. I know buying ready shooting bud in pots is a bit of an expensive way to acquire them but this way I can see where the originally planted bulbs are and avoid accidentally digging them up. I bet they look gorgeous Sue, and they are worth every penny! Do you have any other varieties you can recommend? I love katharine, George and Gordon, but am hoping to expand every year using new varieties. We have Harmony, JS Djit and Joyce but too soon to say whether I would recommend them - it was just what was available at the Garden Centre. I have Katherine already growing in the garden, we visited a GC last week and they had them in pots on the discount stall, I couldn't leave those behind! They make a great colourful addition to the garden this time of year. Of course they had to come home with you Brian, you couldn't leave them there! Do you grow any other varieties ? Yes, I planted two different ones in pots last year, one was George, no sign of flowers yet though! They are invaluable either in or out of the ground at this time of the year. Perfect planning Jane! Thanks Angie. I love the fact that they appear so early in the year, when there is little else to enjoy. I never seem to have much luck with these and they never seem to come back the following year - so I will just enjoy your lovely photographs instead. Have you tried them in pots, Elaine ? I find them so much easier that way. Feel free to borrow away! Katharine would be a worthwhile addition to your garden, I am sure! I wish I had thought to by more of these little gems myself! Mine are planted in the garden and I have awhile to wait to see them. 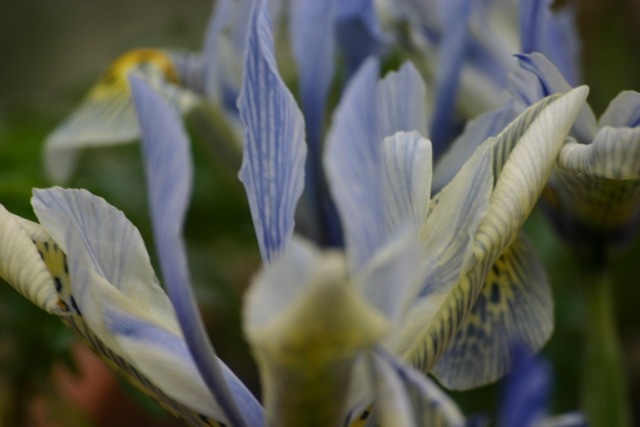 I always find the beauty of these irises is subtle, so they look best in numbers or in pots just as you prefer them. 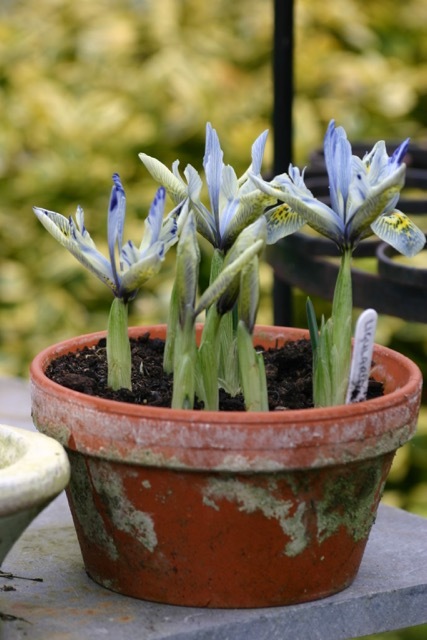 These pots of irises are just lovely! I am sure that they will be worth the wait, Jennifer ! 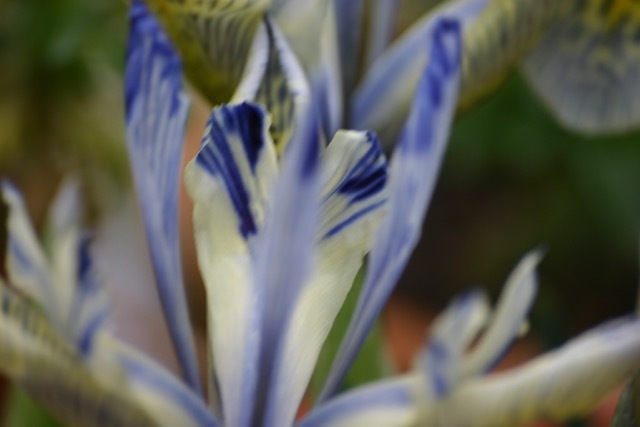 Hello Jane, it is wonderful to see these irises here. A sight of these blooms gives a glimpse of how beautiful are plants from your part of the world. Easy to grow? What a wonderful plant! Hi Stephanie , they are SO easy to grow, I just plant the bulbs and then enjoy the flowers! Couldn't be more straightforward! 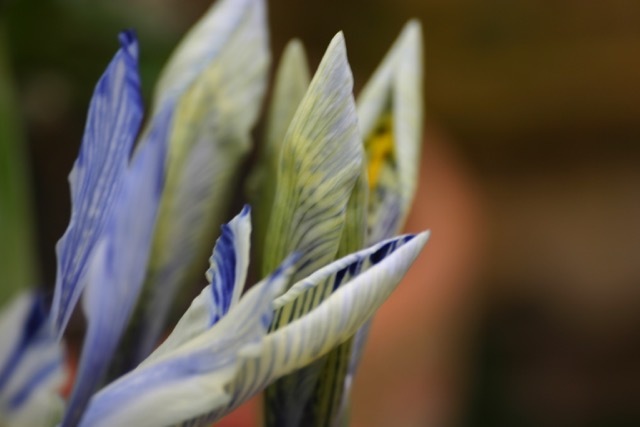 I really prefer Katherine to George, I love the delicate veining. 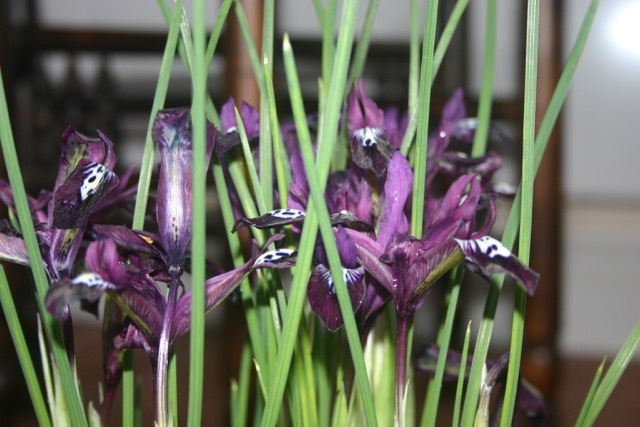 I'm making a note to myself: must plant Iris reticulata this coming fall! 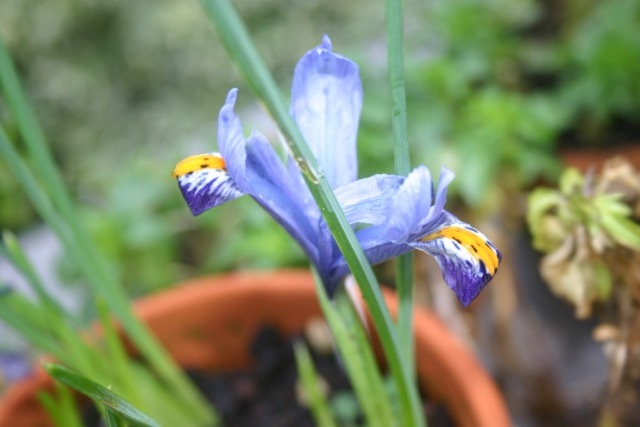 I had Iris tectorum, but it seems to have died out. I agree, Jason, Katharine is my preference too, as she is so unusual. The markings are really intricate . I have not tried I. Tectorum . 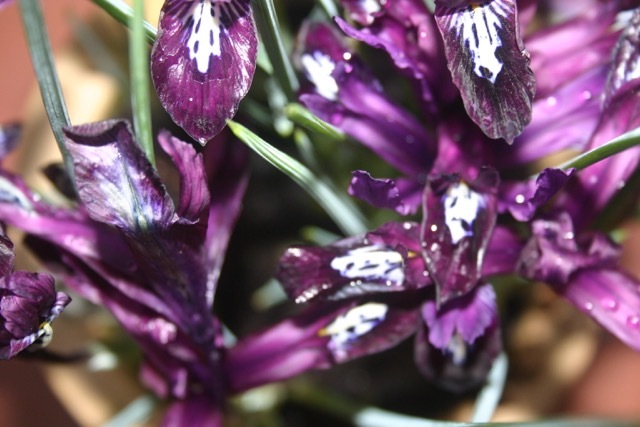 Let me know how your autumn planting of Reticulata goes and which varieties you choose! Gorgeous, every one. Lovely shots. I love them all, but I agree Katharine is beautiful and the very similar Sheila Ann Germaney. But then the richly dark George is lovely too. I give up, impossible to choose a favourite. I really like the Reticulata Irisis Jane, mainly for their earliness and their colour variation. I have some in the ground in a raised spot where they can be seen but find that they tend to deteriorate over time, they grow well for me in containers using a free draining compost but don't seem to mix well with other plants to give continuity but this may be my fault. I agree - I am counting the days until the warmer weather, and the colour it brings. Today it is bright and sunny here, for a change, and I am sure I can detect a teeny, teeny bit of warmth in that sunshine!